We’d love your help. Let us know what’s wrong with this preview of Random House Webster's Unabridged Dictionary by Random House. 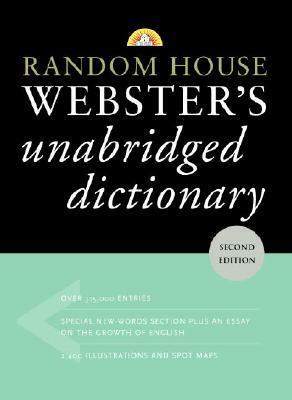 With over fifty years of experience in dictionary publishing behind it, Random House Webster’s Unabridged Dictionary is the most definitive single-volume reference of the English language available. This modern dictionary offers an exhaustive, traditional study of the language, while covering the latest, most important developments–ahead of any other dictionary. The Random House Webster’s Dictionary is designed to meet the wide-ranging needs of today’s students and scholars, who may study ancient documents one hour and surf the Internet the next; of professional writers, who craft poems or write articles for technical journals; of businesspeople, who need to communicate clearly; and–above all–the needs of word lovers. In addition to standard and specialized vocabulary, this extensive volume contains a wide variety of up-to-date, authoritative information. 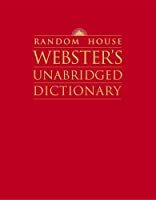 The Random House Webster’s Unabridged Dictionary is a unique general reference volume for the office, the school, and the entire family. ·A New-Words Section in the front of the book with over 1,100 important words and meanings–words such as broadband, urban legend, Disneyfy, and smoothie. 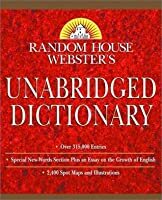 To ask other readers questions about Random House Webster's Unabridged Dictionary, please sign up. Random House Webster's unabridged dictionary with CD-Rom. (2006). New York: Random House. Content/Scope: This dictionary contains over 315,000 entries, and more definitions per word than other leading dictionaries. Over 75,000 example phrases and sentences to demonstrate how words are used in context- 2,400 illustrations and spot maps- Scholarly etymologies show when a term entered the language. The dictionary also explain Random House Webster's unabridged dictionary with CD-Rom. (2006). New York: Random House. Content/Scope: This dictionary contains over 315,000 entries, and more definitions per word than other leading dictionaries. Over 75,000 example phrases and sentences to demonstrate how words are used in context- 2,400 illustrations and spot maps- Scholarly etymologies show when a term entered the language. The dictionary also explains points of usage, pronunciation, distinctions among synonyms, and regional variations and dialects. Accuracy/Authority/Bias: This is the deluxe edition of our popular Random House Unabridged Dictionary, the most definitive single-volume reference of the English language. 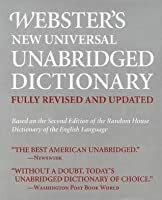 Arrangement/Presentation: This deluxe edition of the popular Random House Webster's Unabridged Dictionary comes in an elegant classic binding, with ribbon markers and thumb indexing which makes the dictionary easier to use. Inside you will find over 315,000 alphabetical entries. There are more definitions per word than other leading dictionaries. You will also find over 75,000 example phrases and sentences and 2400 illustrations and maps. Relation to other works: There are many dictionaries available; this dictionary meets requirements for libraries that serve patrons of all ages. Accessibility/Diversity: The dictionary meets the needs of a diverse population by containing large type and illustrations to make finding information easier for all readers. Professional Review: Look no further --Booklist In an elegant classic binding, the deluxe edition of the popularRandom House Webster's Unabridged Dictionary is a perfect gift for new graduates, serious collectors, and word lovers of all ages. This is the deluxe edition of our popular Random House Unabridged Dictionary--the most definitive single-volume reference of the English language. This compendium of traditional vocabulary and specialized terms offers authoritative factual and encyclopedia information, which, along with the deluxe cloth binding, makes this the perfect gift for word lovers of all ages. This deluxe edition includes: - A handsome cloth binding along with a high-quality box and Gilt edging, making this an attractive gift - Three beautiful ribbon markers and thumb indexing for easy use- Over 315,000 entries, and more definitions per word than other leading dictionaries- Over 75,000 example phrases and sentences to demonstrate how words are used in context- 2,400 illustrations and spot maps- Scholarly etymologies show when a term entered the language- Comprehensive notes at many entries which explain points of usage, pronunciation, distinctions among synonyms, and regional variations and dialects Typeset and Printed in the U.S.A. I mean, yes, it's a dictionary. So I'm not really reading it, though I can't say I've read it. But everyone should have one, right? They really are fun to peruse every now and then. And this is the one I recommend. Well, technically, I haven't read this whole book, but it certainly does come in handy during Scrabble games. Since we like to learn new words, we bend the rules a bit and allow look-ups, provided that we share the definition. I always keep this one next to the computer when I'm working on a writing project, along with the thesaurus - an authoritative reference that has helped me avoid some mistakes that would have been embarrassing. i have yet to find another book with my two favorite words: callipygian and defenestrate. An unabridged dictionary is a must in every household. I got this book for my HS graduation and I think it's awesome.